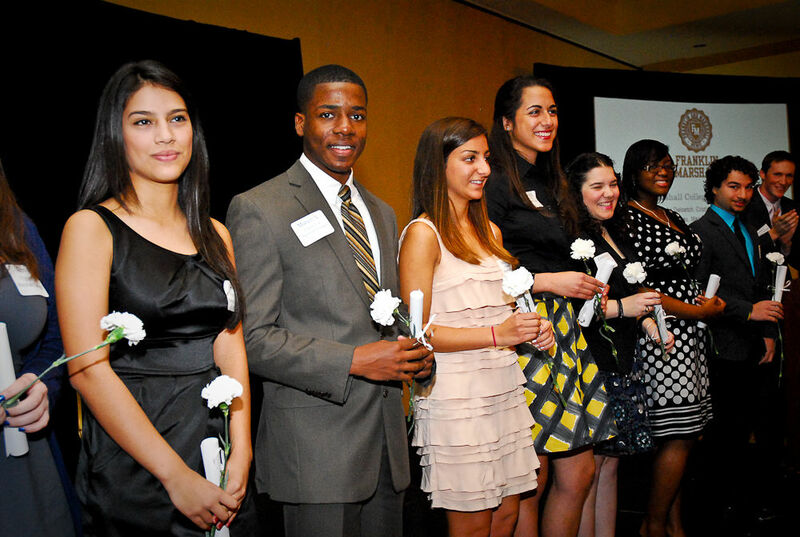 In Miami, members of Franklin & Marshall College's first STEM Posse celebrate their enrollment in January 2012. 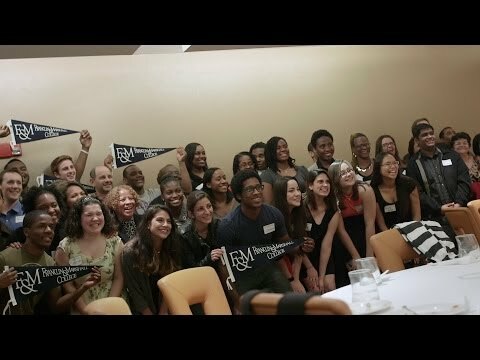 As part of President Barack Obama's Summit on Higher Education at the White House today, Thursday, Jan. 16, the Posse Foundation announced that 10 of the nation’s top colleges and universities, including Franklin & Marshall, collectively will provide Science, Technology, Engineering and Mathematics (STEM) scholarships for 500 students during the next five years. Each college will receive $100,000 per year to help support full-tuition, four-year scholarships for yearly cohorts of 10 talented students from diverse backgrounds demonstrating interest and aptitude in STEM fields, for a total of $5 million. The institutions' additional joint commitment, estimated at a combined $70 million, "represents a unique national collaborative," according to the Foundation, which identifies high-achieving students in underrepresented groups and sends them to partner colleges across the country. Franklin & Marshall was the first liberal arts college to create a STEM Posse in 2011, with 10 students from Miami, and is among five schools pledging to continue their STEM Posse programs. The others are Bryn Mawr College, Brandeis and Texas A&M universities and the University of Wisconsin-Madison. The five additional colleges signing on to create STEM Posses are Middlebury and Pomona colleges, which have existing Posse partnerships, as well as Davidson and Smith colleges, and Georgetown University, which will welcome Posse cohorts for the first time. The White House Summit on Higher Education, convened by the president and First Lady Michelle Obama, brought together leaders of colleges and organizations that have pledged to continue or engage in new initiatives to improve college access. Franklin & Marshall President Daniel R. Porterfield, in recognition of his and the College's efforts to provide exceptional opportunities for students who might not otherwise apply to and succeed at a selective school such as F&M, was one of a select few college presidents to participate in a panel discussion at the summit. Porterfield encouraged others to follow F&M's example of increasing financial aid, forming partnerships with organizations committed to improving college access, and supporting students on campus with mentoring and assessment of their engagement and achievement. The Posse partnership is a key part of those initiatives. "Through our partnership with the Posse Foundation, Franklin & Marshall has provided opportunities for more than 100 students from underrepresented backgrounds with the talent and drive to succeed in college," Porterfield said. "In 2011, building on seven years of success with our New York City Posse cohorts, F&M signed on to become the first liberal arts college to create a STEM Posse. These students now are thriving. Our first cohort of STEM scholars from Miami has a collective GPA that is substantially above the overall class average, and they bring with them an array of gifts that benefit our entire campus community." Posse President and Founder Deborah Bial said her organization "is committed to identifying talented young leaders from diverse backgrounds who can achieve at the most selective institutions of higher education but who might be missed by traditional admissions practices." Posse began in 1989 when a student told Bial, who at the time was working with urban youths, "I never would have dropped out of college if I had my posse with me." "Posse" at the time was a term used in youth culture to refer to one’s group of friends or support system. This simple idea became the basis for a national program that today supports urban, college-bound public school students with exceptional promise and potential for leadership. Posse Board Chair Jeff Ubben and The Tortora Sillcox Family Foundation contributed $5 million of startup money for the STEM initiative, to help support the program over the next five years. The STEM scholars will be recruited in the fall of 2014 and arrive on campuses in the fall of 2015. Each college and university will select a STEM Posse of 10 scholars per year from one of the Posse city locations; provide four-year, full-tuition scholarships for each scholar; support the scholars before they enroll through a two-week STEM immersion program that exposes students to college-level work; and support them on campus with mentors chosen from faculty in the STEM fields. F&M Sophomore Cristina Diez, a STEM Posse scholar from Miami, said Franklin & Marshall has provided her with the opportunity pursue a degree in mathematics "while enjoying the liberal arts experience." "Being apart of the STEM Posse has been an amazing experience," Diez said. "Over the summer, the STEM scholars were invited to campus for three weeks to begin practicing lab techniques and create connections with professors and with fellow STEM scholars. Although many in the group are biology or chemistry majors, I never felt excluded. The support and hard work from my peers is incredible, and I would not trade it for anything." At F&M, Diez is a member of the student group Sophisticated Intelligent Sisters Teaching Excellence Responsibility and Success, or S.I.S.T.E.R.S. She also is a peer mentor working with 11 students from F&M's partner schools such as KIPP and Achievement First. During the summer, she was a facilitator for F&M College Prep, a summer emersion program that offers hundreds of high-achieving, lower-income high school juniors a chance to experience college life inside and outside the classroom and to learn about the application process. "During my junior year of high school, my college adviser told me about the Posse Foundation after another student from my high school received a scholarship," Diez said. "She told me about the partnership F&M was creating with the Miami Posse office. As soon as she mentioned F&M, I was interested."